Got a fancy camera but don’t know how to make the most of it? This workshop may be for you. I will teach you the basics of photography and how to shoot in manual mode so that you have full control of your camera. I will show you an easy approach to find the perfect setting and provide you with a cheat sheet so that you can continue to practice. No. This workshop is for beginners. Bring your manual if you don’t know how to change the settings on your camera. We can help you with most models of Canon & Nikon DSLRs – other models you may want to bring your manual just in case. A DSLR is ideal, but any camera where you can shoot in manual mode will work. I know you usually shoot film, so do I also have to shoot film for this class? Not at all. I’m teaching you the basics of photography, which applies to all cameras. I will be bringing my digital camera so that I can instantly demonstrate, so bring yours too! What if I know nothing about photography? I taught high school for 5 years where I routinely differentiated my instruction, so no prior knowledge is required. If you wanted to prepare though, it would be helpful to know how to change your ISO, aperture, and shutter speed before class (just where those buttons are) – but again, it’s not a requirement. Where and when is this workshop held? Tentatively 9am in Pasadena, CA on October 20th. More details will be sent to you after you’ve enrolled. What else do I have to bring? A working camera with batteries, and something to take notes with. What is the investment and how do I pay? Tuition is $310 and can be paid via Paypal on the button below. Click below to reserve your spot today. 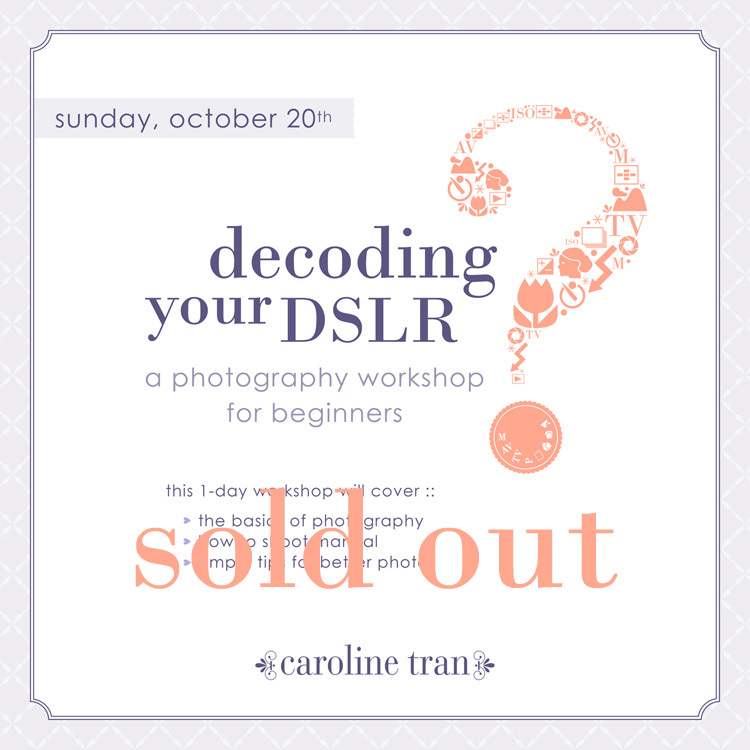 All of my workshops in the past have sold out and I expect the same for this.